Blogging the web, technology, and more. Spotify announced this week that it’s finally coming to the US. The streaming music service has been hugely popular in Europe since it started in late 2008, but presumably the record label deals have kept it from reaching the US… until now! Spotify offers three plans: Free, Unlimited, and Premium. The service is currently invite-only in the US for the Free plan, but if you are willing to pay $5/month for Unlimited (or $10 for Premium), you can sign up now on the Spotify website. On Thursday morning I received an invite for the free version but quickly upgraded to the Premium plan in order to give the service a fair trial. The Premium version offers mobile streaming, offline support, 320 Kbps high quality audio, and manages your local files in iTunes. So far, I have been extremely impressed with the service! 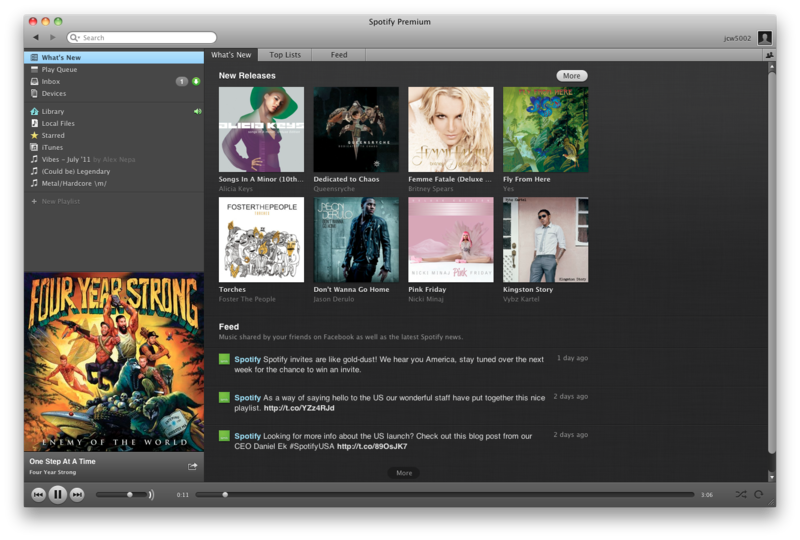 The above screenshot shows the Spotify landing page. This page shows you the latest popular albums and allows you to begin streaming them for free. With the Premium account, you can listen to this on your mobile device and even download the tracks for offline listening. I also like how this section provides a “Top Charts” section similar to iTunes music. You can stream all of these tracks right from the charts. The most impressive feature so far has been the ability to import my iTunes library playlists into the Spotify app with a single click. This doesn’t really provide any useful features on my iMac containing the iTunes library. However, on my MacBook Pro at work I can now stream a huge majority of my iTunes library from Spotify without needing to copy gigabytes of music to the laptop. This is essentially the same feature that iTunes Match promises, except that Spotify allows you to stream the music instead of re-download it. This is MUCH more useful to me. Full iTunes library synced and available for streaming from other devices. Spotify claims to have over 15 million tracks in their library. This is very apparent, and a huge majority of my music collection is available in Spotify for streaming. They have basically every new release and an impressive collection of older albums from many artists. Apparently, Spotify will also get some exclusive albums for streaming before they are released to the public. Cool! 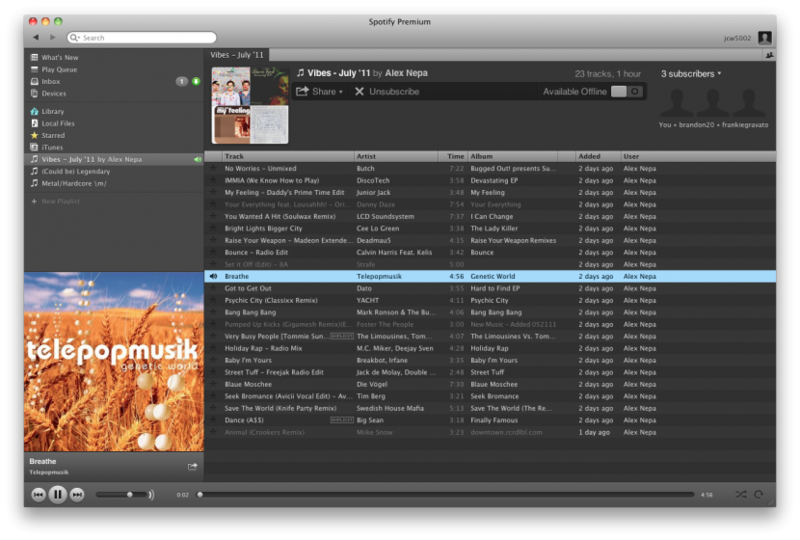 My main gripe with the Spotify Desktop application is the “missing features” compared to iTunes and Songbird. I haven’t figured out how to add Year or Genre view options to the Library or Playlist views. There’s no ability to sort by Date Added or even see track numbers in the Starred playlist. It’s possible that I’m trying to use the service in a way it wasn’t intended, but hopefully some of these features will come in a future software update. It seems like only 10% of potential features have been implemented yet, which is actually kind of encouraging for the future. Spotify is available on the iPhone and many (although not all) Android phones. The iPhone app is pretty cool and offers access to your playlists and allows you to download music to the phone for offline support for airplanes or road trips in the mountains. The application seems a bit limited compared to the desktop app, but most of the critical features are there. We have pretty solid AT&T 3G service here in Raleigh, NC and I’ve been streaming at 320 Kbps while driving and sitting by the pool. It works pretty well, but not perfect. I’m still planning to keep some local Mp3s on my iPhone. When compared to iTunes Cloud, I think Spotify still wins big here since they provide the ability to stream high quality music without requiring the tracks to be re-downloaded and stored locally on the device. There are some impressive social features included with Spotify. Unfortunately for me, many of those features are closely tied to your Facebook account. Since I quit Facebook nearly two years ago, that leaves me with a bunch of awkward and sometimes broken social features. For example, I can’t set a profile photo or easily find other friends using Spotify. I think this is something they are planning to change in the future. It shouldn’t affect too many people since nearly everyone has a Facebook account. Spotify includes a cool “Public Playlists” feature where you can choose to make your playlists public for other Spotify members to see when visiting your profile. You can Subscribe to other users’ playlists and even create “Collaborative playlists” which can be curated by your friends! Right clicking on an album or track gives you the ability to share the track on Facebook, Twitter, or with other Spotify users. Once shared, your friend will see an incoming message in their Inbox containing the shared track. This is awesome! Share tracks with your friends and listen to shared tracks via the Inbox tab. 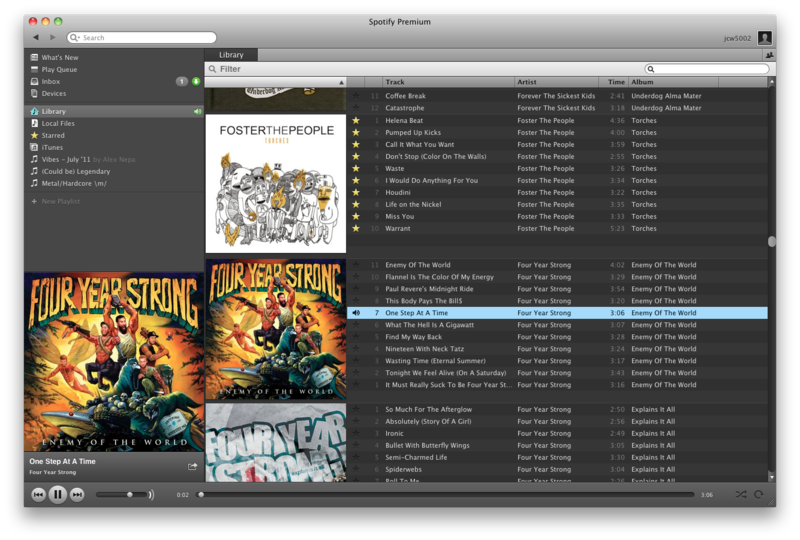 It’s only been a few days, but I’m really loving the Spotify desktop features. 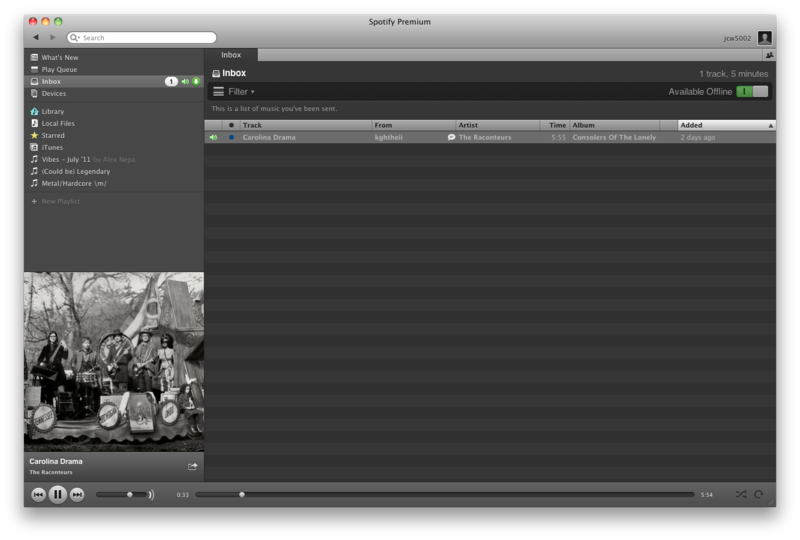 The ability to stream a huge portion of my music library on my Macbook Pro at work is a killer feature. Beyond the iTunes playlist sync, I have full access to the huge selection of music on Spotify and I’m excited to explore new music effortlessly. I’m not sold on the Spotify iPhone app, yet. It doesn’t work perfectly with my car’s USB connection and the 3G connection is not flawless when streaming. I have a pretty good system for syncing my iTunes music to my phone, so I’m not very tolerant of bufferring, skipping playback, or lower bitrates. It’s still a neat feature to have but I can’t see myself relying on it as my only source of mobile music. I definitely recommend checking out Spotify. I do have a few invites. If you would like one, leave a comment and I’ll see what I can do. I would encourage you to check out the Premium or Unlimited plans if you are really interested as these plans provide the “true” Spotify experience. Posted: July 17, 2011 at 3:23 pm in tech.